I don’t like Chinese food, so I just always [wrongly] assumed I wouldn’t like Thai food either. Similar taste profile and all. Chinese food is way too salty, for the most part, for my liking… and I don’t particularly like that distinct taste. I hesitantly tried Thai food last November when a bunch of us cousins went to a local [halal] place, called N’ Thai Palace, and I was pleasantly surprised that a) it didn’t taste like Chinese food and b) I actually liked it! It was flavorful, visually pleasing and delicious. I had been meaning to go back but didn’t get the chance to… except for the one time I got all the way there only to find out that the restaurant was closed on Mondays! All of us got different meals to try and we each loved everything. Which is rare– usually some are good while others… not so good. I especially liked their drunken noodles and Mango Chicken and Shrimp. Last week, I tried another local [halal] Thai place with a friend– this time to Pan Asia [also closed on Mondays]. It was just as delicious; so much so that I got the family to try it for dinner last night. I love their Pad Thai with chicken and the rest of my family also liked their Hakka Noodles [with chicken] and Chicken Fried Rice. I cried [plenty of times… but that shouldn’t be surprising], I laughed, but so many times I just paused… to reflect and to ponder. The choice of words are brilliant. I think that is what captivated me the most. The Fault in Our Stars by John Green is a quick, easy, articulate and captivating read. I finished it in a few sittings in a less than a 24-hour time frame. I love how beautifully honestly it is written. How honestly sarcastic the teenager is portrayed. It is what it is. What’s it about you ask? Literally: two teenagers with cancer who fall in love [depicting their inner struggles, etc.]. My take? It makes you think. Deep. Not just about death and dying, but life and living. My cancer is me. The tumors are made of me. They’re made of me as surely as brain and heart are made of me. It is a civil war, Hazel Grace, with a predetermined winner. I finally caved in and read The Hunger Games yesterday. I feel like that’s all everyone has talked about lately. It’s been all over my social network feeds, that’s for sure. It sat on my side table for weeks (probably longer) after Imran lent me the book and insisted I read it (along with Faraz). Two nights ago, I picked up the book and couldn’t put it down! I read nearly a third of the book before falling asleep and finished it off yesterday morning reading it every chance I got (in the car, etc.). The book captures your attention, keeps you on the edge of your seat, and you just can’t read it fast enough! Although it wasn’t my style of reading, it kept me captivated for most of it. It’s written really well and so descriptive that it makes you feel as if you are there in person observing the moment. Many people have asked me what I thought of the book — and the best way I could describe it is that it’s like a more evil version of The Lord of the Flies and 1984 put together. The concept is cruel, inhumane, and absolutely absurd…. but it sure makes you think! Am I going to watch the movie? Absolutely not. I can’t stomach gruesome scenes for the life of me. Have you read The Hunger Games ? Did you watch the movie… or are you planning on it? What do you think of it? If you haven’t read/watched… is there a reason? I love seafood… and tilapia is one of my favorites! So it should come as no surprise that one of my favorites when I go out to eat is the Wood-Fire Grilled Tilapia at Red Lobster. It’s what I get EVERY.SINGLE.TIME. I go there. Without fail. Love the Caesar salad at Red Lobster. LOVE their biscuits. I finally convinced my parents to go there about a year and a half ago for the first time. Since then, I have gone with them twice more — the most recent time was today. In fact, we went today solely for their wood-fire grilled tilapia (my mom tried a piece of mine last time and loved it as well). Two out of the three times I’ve gone with them, however, they have for some reason not had Tilapia available. This is despite the fact that it’s listed on their menu and on their list of “Today’s Fresh Fish”. I was not informed that they didn’t have any Tilapia until I placed my order, and was quite disappointed. Especially because this isn’t the first time that has happened. We went during peak dinner time (7 PM), so it is not like we went really late and they might have ran out of tilapias by then. If we went really late, and they didn’t have any available at that point, I would have attributed it to that. While I liked the Parrot Isle Jumbo Coconut Shrimp that I ordered today, it wasn’t what I wanted. I go to Red Lobster pretty much for their wood-fire grilled tilapia and their biscuits and if I am not sure I’ll be getting that — I don’t know if it is worth going there! 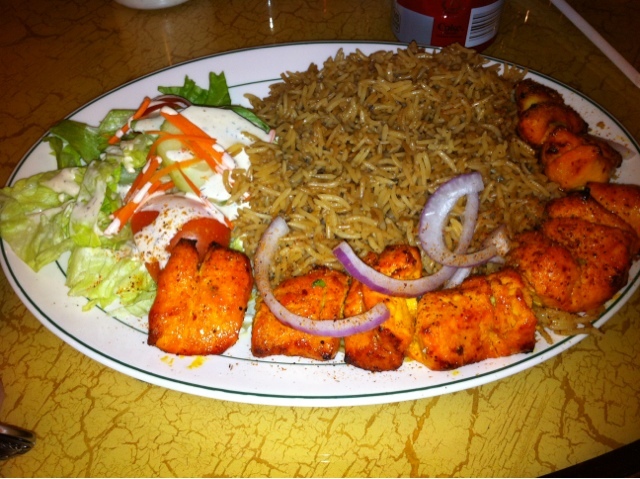 Choopan Grill is a new Afghani Restaurant that opened recently in our area. It apparently has two other locations by the same owner in NY (or so I’ve heard). I tried it today with three of my cousins (and we all love Afghani food). The service was… not so great? We were the only ones there for a pretty long time (it was around 7 PM) and the greeter/server pretty much “watched” us, which is beyond creepy and annoying. Then, she came over and asked “what do you want?”. What I wanted to say was, “to leave”… but, of course, I didn’t do that. They are going to have work on how they talk to their guests because it was very unwelcoming. Portion size was good (too much for me). Taste was okay — not great, but not bad either. There are definitely other Afghani restaurants in the area that I would recommend instead. There wasn’t really anything memorable about Choopan Grill that would make want to go back there again. I went with a bunch of girls, and so got to ‘sample’ a few different dishes. I can honestly say I only liked what I ordered. I got the Chicken Kabab and it was juicy and delicious. I found a few of the other dishes to be on the dry and bland side (like the chicken shawarma). Staff — Seemed friendly, but I guess because it’s a new restaurant and they aren’t very busy yet (we were the only ones there)… they pretty much watched us eat. Did.not.appreciate.that.at.ALL. The place is decorated nicely though, which was a major plus! It’s new so it was clean and welcoming. A major downer — would not let us split the check in terms of giving them separate credit cards. Who doesn’t do that? We either had to pay cash or put it all on one card… so it would be a hassle for someone to go there with a group of friends. I hope they change that soon. The youngest person in my house is 22 (me! ), so I am sure many would be surprised if they heard that we recently bought a children’s book. I gotta admit, the book is pretty good – and I’m not just saying that because I’m a supporter of him. All politics aside the story line is good, as is the moral of the story. It essentially introduces various famous Americans (13 of them) with various traits/characteristics that they are known for (and each introduction starts in the form of a “Have I told you…?” question). The core of the story is, of course, that America is made up of a diverse group of people from all sorts of backgrounds who all bring something different to the table and each one is as important as the other. By the way, a 100% of the profits are being donated to a charity. Have you read it? What did you think of it? I’ve had several things from here and have enjoyed them all. My favorite is the Chicken Tikka Sandwich with fries. Their chicken wings are delicious, their hummus is great. I was hesitant yet anxious to try their fried chicken and that was great as well! I love fried chicken, but usually most places don’t made it so great. Oh, and their lamb chops are delicious too — and I’m not even a meat fan usually! Their gyros are great — portion is great for two people to share in my opinion — as are all of their entrees. This place has become a favorite for my family very fast. It’s a popular place here and is usually packed, but we can usually find a table. We live nearby though, so taking it to go is not a problem either. A good photographer makes a world of a difference, don’t you think? My cousin, Samia, recently started a photography business of her own, called Aurora Moments Photography. She’s based in New York (but does events in New Jersey and other local areas as well). I’m not just saying this because she’s my cousin, but she is a great photographer! She actually started her business to cater towards Muslim brides who are looking for female photographers, but she does all sort of events — everything from portrait sessions to birthdays to graduation parties to weddings and everything in between. Click here to check out some portfolio pictures on her Facebook fan page and you can contact Samia Ahmad at samia@auroramoments.com for all of your photography needs. Yesterday, my brothers, Shazia and I went to Max Brenner in NYC. Faraz had been there before, but it was the first time for the rest of us. it consists of double chocolate melting chunks, bananas, and peanut butter.